A major feature of human intelligence is that it allows us to contemplate mental life. Such an understanding is vital in enabling us to function effectively in social groups. This book examines the origins of this aspect of human intelligence. The five sections attempt firstly, to place human development within an evolutionary context, focusing on the possibility of innate components of understanding. The second aim of the book is to examine the roles of early perception, pretence and communication as precursor skills in the development of a grasp of mental states. Thirdly, attention is given to the possibility that children know a good deal more about the mind than is apparent from many studies designed to probe their abilities. Taken together, the chapters in this book mark a new focus within a 'theory of mind' movement, examining a group of skills in infancy and early childhood which culminate towards the end of the preschool period in a more mature understanding of one's and others' mental states. Drawing together researchers from diverse theoretical positions, the aim is to work towards a coherent and unified account of this fundamental human abiity. This book will be of central relevance to psychologists and those in related disciplines, particularly education and philosophy. 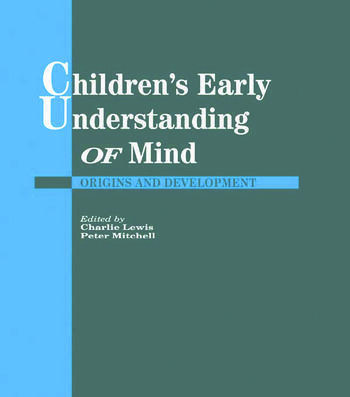 P. Mitchell, C. Lewis, Critical Issues in Children's Early Understanding of Mind. Part I: Ontogenesis of an Understanding of Mind. P. Mitchell, Realism and Early Conception of Mind: A Synthesis of Phylogenetic and Ontogenetic Issues. A. Whiten, Grades of Mindreading. R.P. Hobson, Perceiving Attitudes, Conceiving Minds. N.H. Freeman, Associations and Dissociations in Theories of Mind. Part II: Attention, Perception and Cognition: The Legacy of Infancy. G. Butterworth, Theory of Mind and the Facts of Embodiment. D.A. Baldwin, L.J. Moses, Early Understanding of Referential Intent and Attentional Focus: Evidence from Language and Emotion. A. Gopnik, V. Slaughter, A. Meltzoff, Changing Your Views: How Understanding Visual Perception Can Lead to a New Theory of the Mind. S. Baron-Cohen, H. Ring, A Model of the Mindreading System: Neuropsychological and Neurobiological Perspectives. Part III: The Role of Pretence. A. Lillard, Making Sense of Pretence. P.L. Harris, Understanding Pretence. J. Perner, S. Baker, D. Hutton, Prelief: The Conceptual Origins of Belief and Pretence. A. Lillard, P. Harris, J. Perner, Commentary: Triangulating Pretence and Belief. Part IV: The Role of Communication. J. Dunn, Changing Minds and Changing Relationships. M. Shatz, Theory of Mind and the Development of Social-linguistic Intelligence in Early Childhood. H.M. Wellman, K. Bartsch, Before Belief: Children's Early Psychological Theory. E.J. Robinson, What People Say, What They Think, and What Is Really the Case: Children's Understanding of Utterances as Sources of Knowledge. Part V: Misrepresentation. B. Sodian, Early Deception and the Conceptual Continuity Claim. M. Chandler, S. Hala, The Role of Personal Involvement in the Assessment of Early False Belief Skills. M. Siegal, C.C. Peterson, Children's Theory of Mind and the Conversational Territory of Cognitive Development. C. Lewis, Episodes, Events and Narratives in the Child's Understanding of Mind.